A pinky promise to see each other at beach camp next year. "I started volunteering at my school's Friendship Club and I enjoyed hanging out with the kids so much that I decided to volunteer at programs outside of school. The kids are always so happy and I love being around them!" 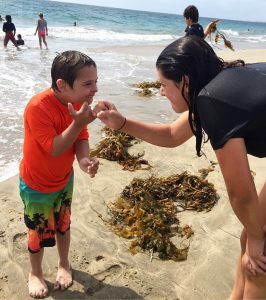 Through the Friendship Foundation volunteer program, remarkable bonds are forged between children with special needs and their new friends. In addition to making an impact on a child, volunteers will see changes in themselves, becoming more fulfilled, self-confident and empowered. Our volunteer program began in 2005 with 22 members. Today, more than 1,200 dedicated individuals participate in this wonderful program. Few bonds in life are more influential than those between a young person and a caring older adult. The Bridges Program serves to bring together senior volunteers in the community to engage with our young adults with special needs. We want seniors to share their knowledge and life experiences with our young adults. 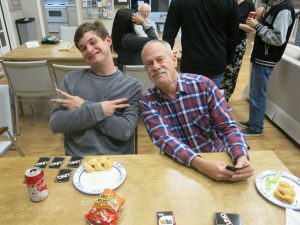 Through fun social activities like Bingo and Game Nights, we hope to bring together two generations to connect and build friendships. If you are interested in volunteering please fill out the registration form by clicking the link below. We love seeing our young volunteers excel which is why we created programs specially designed for volunteers that encourage growth and leadership. We provide useful tools, skills, and information about working with the special needs population so our volunteers feel confident and prepared when they show up to their first program. Our volunteers are an integral part of our model and it is with their dedication that we are able to accomplish so much. This program is an immersive, participatory experience that builds personal responsibility and leadership skills through group activities, problem solving and projects. Students will learn to engage those around them, utilize their resources, network with others and gain confidence in their leadership skills. The curriculum will align with the “7 Habits of Highly Effective Teens” by Sean Covey. Your teen will have to commit to attending all 3 classes (6 hours total) and will be awarded a Certificate of Completion on the last day of class which can be added to their college portfolio. Dates for this year's workshop coming soon! This program is only available to Friendship School Club Leaders. We provide one-hour volunteer training sessions every other month to help our new volunteers gain knowledge about the work we do and teach them skills they can implement to be successful volunteers in our organization.We require every new volunteer to attend the training and earn their first volunteer hour. 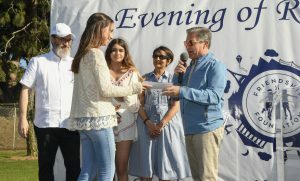 Each May, we host an awards ceremony called Evening of Recognition where volunteers are celebrated for their time spent with the Friendship Foundation. Besides the awards listed below, we also give special recognition to outstanding Friendship School Clubs and recognize the leaders of the clubs. Volunteers are a gift to our program and we are grateful for their generosity. Awarded to volunteers who have completed 50+ hours of voluntary service in our community programs. Awarded to volunteers who have completed 100+ hours of voluntary service in our community programs. Awarded to volunteers who have completed 200+ hours of voluntary service in our community programs. The SKECHERS Foundation provides college scholarships to high school seniors who have also committed a considerable amount of volunteer time to the Friendship Foundation. A recommendation letter from the Director of the Friendship Foundation is required. Scholarship applications open in March.